A massage table is the most important tool for most massage therapists. With so many different options available on the market today, it can be difficult to find one that accommodates your needs while providing comfort to your clients. Our team conducted extensive research to find the best massage tables across four major categories – portable tables, electric tables, heating tables, and adjustable tables. 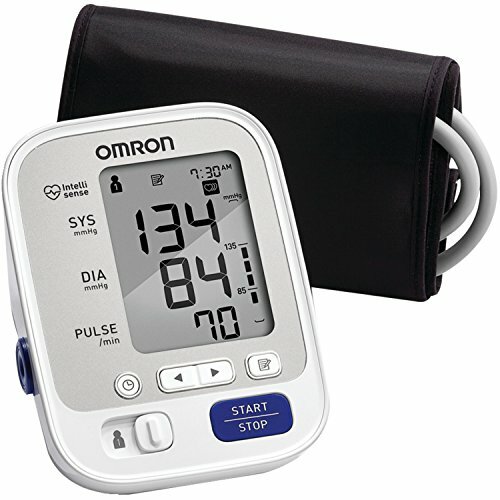 We provide information about their top features and functions to help you make an informed purchase. Read more about our methodology. The Earthlite Avalon Tilt is versatile enough for both massage therapists and orthopedic physical therapists. 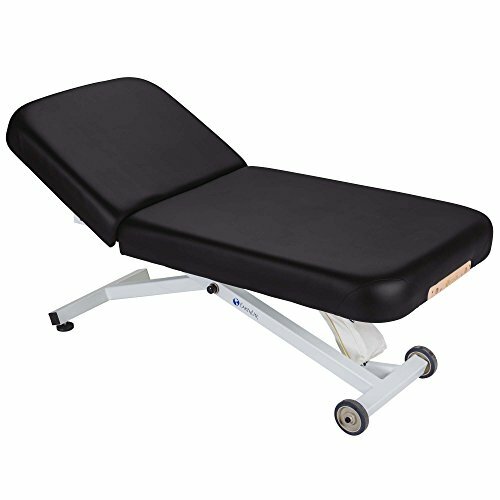 Its features, such as its adjustable height to accommodate different therapists working in the same practice, make this model our top pick for best massage table. The Master Massage Santana LX ranks high for durability, comfort and portability. It has a unique and luxurious design that stands out from the crowd. We recommend this as the runner up for best massage table due to the high quality features at such a reasonable price. If you’re struggling to find a high quality table that’s sturdy and portable, the Sierra Comfort Preferred is the best bang for your buck. The high maximum weight capacity and adjustable options makes it our top pick for the best value. The BestMassage 84” table is lightweight and portable. Massage therapists benefit from features such as adjustable height and length. The price point and functionality of this table makes it our runner up for the best value selection. 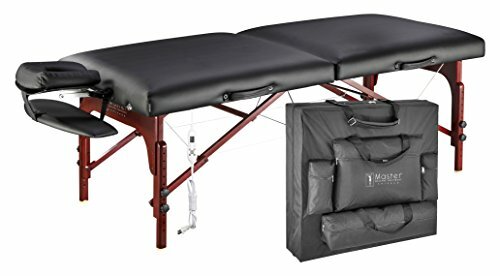 If you’re searching for a lightweight and portable table that doesn’t sacrifice on quality or accessories, the Master Massage Montclair delivers. Featuring an adjustable heated top, it folds and fits into a carrying case for easy transportation. The Earthlite Ellora massage table adjusts to different heights, tilts, and angles in complete silence with a quiet electric motor. We recommend it as the best electric massage table because the easy to use foot pedals allow for hands-free adjustments. The Master Massage Santana massage table eliminates the need to purchase a separate heating pad. With 10 adjustable heat settings to add soothing comfort while improving client circulation, we recommend this product as the best heating massage table. 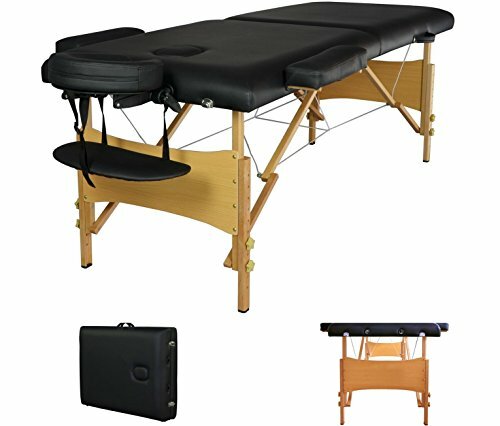 The Saloniture Professional massage table is fully adjustable to accommodate multiple positions for different clients. It comes with extra accessories, including an arm sling and lumbar support cushion, adding value to the adjustable functions of this table. One of the first things to consider is your current and prospective clientele. You want to make sure that your table can accommodate even the heaviest clients while you’re adding additional pressure to it as well. Higher weight capacity usually translates to greater durability and stability too. You’ll see maximum weight capacities ranging from 350 to 750 pounds. Lots of massage therapists make house calls, so they need a table that is portable. Some tables are meant to stay stationary in an office, while other tables have unique features such as foldable storage compartments and a large carrying case that makes it easy to bring on the road. These tables assemble in just a few easy steps so it doesn’t take too much time to set up at each appointment. Heat is a common component used in massage therapy. If you use heat on regular basis, you may want to consider getting a table that has built in heating. This feature eliminates the need to buy heat pads separately. Look for tables that have a wide range of heat settings based on how much you want to use for different clients. There are so many features that can be adjusted on a massage table. Depending on your primary usage, you may want to consider a table that has a lot of adjustable capabilities so your options aren’t limited. Some of the most common components that adjust include the height, length, headrest, armrests, back tilt, and heat. 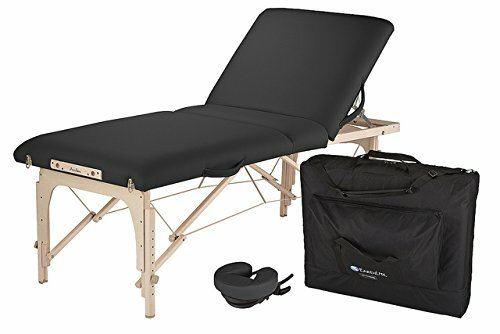 You can find a basic massage table for less than $80. For a better model that has features such as a carrying case, adjustable height, and removable headrests, there are viable options in the $125 to $160 range. For a top-of-the-line model that’s durable and has a higher weight capacity, you can expect to pay up to $270. If you need heating pads built in to the table, it will cost roughly $315. 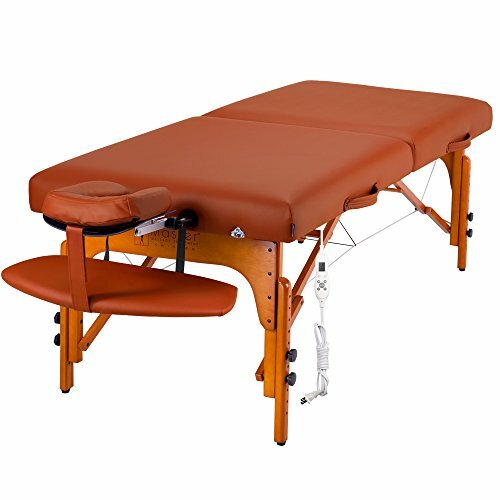 Tables that are used by physical therapists in addition to massage therapists are priced up to $460. Depending on the size, electric tables range from $1,300 to $1,900. We research hundreds of products in order to bring you a final, unbiased list of the very best. We also use a proprietary algorithm to score each product in terms of quality, value, and brand reputation. These subscores are then weighted to calculate our overall scores. Read more about how we calculate our scores. Weighing only 34 pounds, the Earthlite Avalon Tilt is easy to transport. Its use by orthopedic and physical therapists, as well as licensed massage therapists, is unique compared to other tables we researched. The table is made to add to the client’s comfort with features such as the memory-foam face cradle. Its high-quality components keep the table silent and sturdy while in use, so the client isn’t disturbed. Versatile usage. In addition to licensed massage therapists, orthopedic and physical therapists use this table as well. The table remains stable while practitioners provide intense body manipulation movements to PT patients. Quiet design. Compared to other tables that make squeaking, cracking, or rattling noises while in use, the Earthlite Avalon Tilt table remains silent so the client isn’t disturbed. Memory-foam face cradle. The face rest is made with plush cushioning material that contours to the unique head shape of each client. 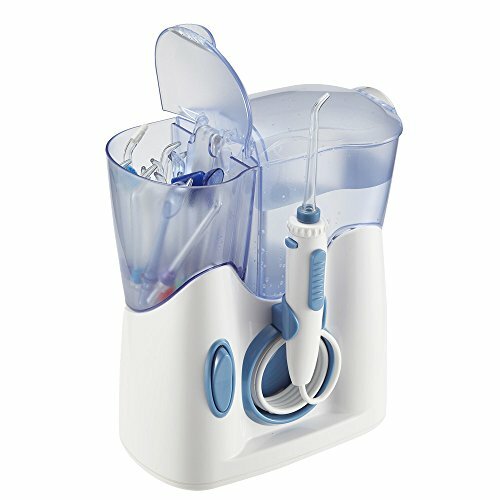 This feature maximizes comfort and reduces pressure on the client’s neck and sinuses. Adjustable height. Ranging from 23” to 33”, the table can be shared by different therapists working in the same practice. This adds comfort to the massage therapist without the need to switch tables. Foldable for easy storage. The table folds in half, fitting all the extra components on the inside. It’s easy to assemble and easy to store when not in use. It weighs only 34 pounds so it’s easy to take on the go. Awkward to move. Although the table is portable, the bulky design when it’s fully assembled makes it difficult to move around within a room. The Santana LX allows massage therapists to focus on their work without worrying about damaging the table with oils or water. Weighing only 35 pounds, it’s easy to transport but can still support 750 pounds of weight, the highest we’ve seen for a table this size. Overall, the adjustable features and comfortable components paired with the sleek design allow therapists to impress their clients. High maximum weight capacity. Supporting up to 750 pounds of weight, the Santana LX has the highest maximum weight capacity that we’ve seen compared to other tables of a similar size. Carrying case for easy portability. Customers report that the carrying case included with the table makes it easy to transport to different locations. It only weighs 35 pounds, so it’s not too heavy to carry. Sleek design. The unique color scheme and glossy wood finish give this table a luxurious look and feel, compared to most massage tables on the market. Durable covering. Users say the table is resistant to water and oils used during massages. The upholstery doesn’t damage easily, and customers say it has lasted well over 5 years without peeling or cracking. Comfortable features. The face cradle is adjustable and comes with a memory foam pillow. The armrests are also fully adjustable and removable as well. Clients tell their therapists that the table is extremely comfortable to lie on, even for long massages. Built in heating not included. If you want to add heat to a massage, you’ll have to purchase a heating pad or blanket separately. Sierra designed a foldable and portable table that has plenty of room to store all of the detachable components. Weighing only 33 pounds, it’s easy to transport with the briefcase-like handles when the table is folded. Although it’s adjustable, the table is strong enough to support heavy clients yet easy for amateurs to assemble in their homes. Sturdy support system. Customers report that the table is strong and secure while supporting clients of varying weights. The manufacturer claims that it can support up to 450 pounds of weight. Adjustable options. 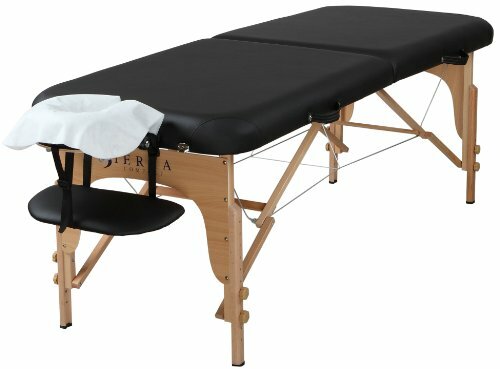 The Sierra Comfort massage table has adjustable legs, ranging from a height of 23” to 33”. It also has a fully adjustable face cradle, providing added comfort to clients. Simple folding for easy storage. The legs collapse completely beneath the table and all of the extra components fit underneath as well. Furthermore, the table folds up and has handles that make it look like a suitcase, which makes it easy to transport. Easy for amateurs to use. Some customers who are not professional massage therapists said that they purchased this table for personal use in their homes as it is easy to assemble, even without proper training. Not ideal for long massages. Compared to other massage tables, this two-inch foam cushioning isn’t the most comfortable option, so it’s best for massages that are 30 minutes or less. BestMassage makes a fully functional, high quality table at a fraction of the price of similar models on the market. Not sacrificing quality for price, it has removable components as well as adjustable height and length options. 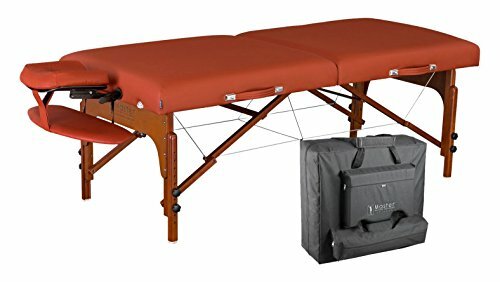 The lightweight design and carrying case make this table easy to transport for massage therapists who work on road. Adjustable length and height. This table is 73” long but can expand to 83” in length to accommodate taller clients. Furthermore, customers report that the adjustable height, between 24” and 33”, helps give them proper leverage for different massages. Removable headrest and armrests. Customers say that the side armrests and headrest can easily be removed with minimal effort. These components add versatility and options for various client needs and comfort. Lightweight and portable. The table weighs less than 32 pounds. It folds into a compact design and comes with a carrying case, making it easy to transport between locations. Headrest is not adjustable. Although the headrest can be tilted, it’s not fully adjustable and it’s fixed in place when attached. A portable massage table is ideal for massage therapists who take appointments on the road. They visit their clients’ homes or offices to provide care and need a table that accommodates transportation requirements. These tables are typically lightweight and come with a carrying case to hold the table as well as detachable components and accessories. Weighing 37 pounds, the Master Massage Montclair Therma-Top is easy to transport in the provided carrying case. The assembly process is simple and fast. Lightweight and portable, this massage table has a 650-pound working weight capacity. It also has an adjustable, heated surface, making it a top-performing model compared to other portable tables on the market. Carrying case included. Fully assembled, the table is 73” long and 31” wide. However, it easily folds and fits into the carrying case for easy transportation. The case has multiple pockets to fit all the attachments and removable components of the table. Adjustable heated top. The Montclair Therma-Top has a built-in heating system, meaning the massage therapist doesn’t have to purchase a heating pad to soothe clients’ muscles. High maximum-weight capacity. Customers report that duo-plane hinge and steel cable reinforcements add stability to the table. Supporting up to 650 pounds of working weight, therapists don’t have to sacrifice quality for portability. Fast assembly process. This table can be fully assembled in just a few easy steps once it’s removed from the carrying case. Customers say that the fast assembly makes it easy to set up for their appointments on the go. Problems with heating controller. Some customers reported that the LED controller was unresponsive at times when they tried to adjust the heat settings. Electric tables are perfect for therapists who frequently adjust the table position throughout the massage. Rather than repositioning the table manually, the electrical components allow adjustments without having to move the client. The best electric massage tables have foot pedals to control the adjustment, leaving the therapist’s hands free to continue the massage. The silent motor allows massage therapists to adjust the table during a massage without disrupting their clients’ relaxed state of mind. In addition to the comfortable three-layer cushioning system, the Earthlite Ellora massage table comes with foot pedals, so it’s easy for therapists to alter the table position without stopping the massage to use their hands. Quiet motor. Unlike other electric massage tables, the Earthlite Ellora is silent as it adjusts positions. Therapists report that this feature keeps their clients relaxed as they enjoy their massage without interruption. Hands-free adjustment. The table has foot pedals that allow the massage therapist to adjust the height and position. Customers report that they can continue the massage unimpeded since they don’t have to adjust the table with their hands. Extreme comfort. The Earthlite Ellora is made with three layers of cushioning and rounded corners to maximize comfort. Massage therapists say that their clients claim the table is comfortable enough to sleep on. Not easily portable. Although the table has wheels to move it around within a room, it wasn’t designed for frequent transportation between multiple locations. Heated massage tables help improve circulation and relax the client. Rather than buying a massage pad separately, massage therapists who frequently use heat in their practice can benefit from built in heating components. The highest quality heating massage tables come with a wide range of heating adjustment settings to accommodate a wide range of client needs. Providing massage therapists with 10 adjustable heat settings, the Master Massage Santana delivers high performance for the price. Its ergonomic design benefits the client as well as the therapist. 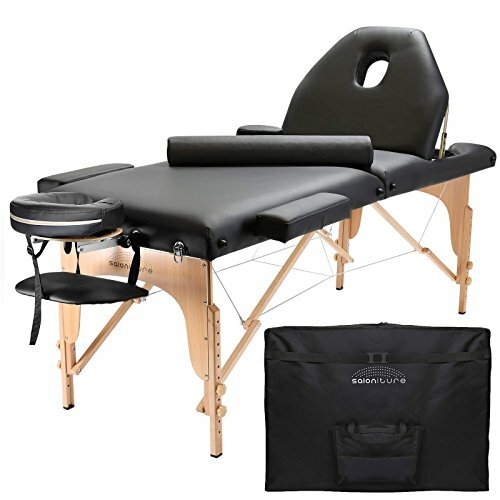 The table has a cushioned and adjustable face cradle to accommodate clients’ preferences while providing comfort and support to the massage therapist with Reiki end panels. Adjustable heat settings. This Master Massage model has 10 different warming temperatures. The safe heating system helps improve circulation and comfort for clients during a massage session. Ergonomic and adjustable face cushion. Compared to other massage tables where the face rest is fixed in one position, the Santana model has a cushioned and adjustable face cradle. Clients can modify this feature to maximize their comfort during a heated massage. Multiple Reiki panels. Customers report that the sturdy Reiki end plates on each side of the table help support their knees and give them added leverage as they massage their clients from a seated position. High maximum-weight capacity. Master Massage Santana model can support 650 pounds of static weight and 1,500 pounds of working weight. Consumers said the table is sturdy even for their heaviest clients. Armrest is too high. Even when it’s fully adjusted, some users reported that their clients with long arms felt cramped because of the armrest position. Adjustable massage tables have added accessories and components such as removable armrests, lumbar support cushions, headrests, and arm slings. These tables also can tilt and adjust to different angles based on the type of treatment a client needs. The multiple position options are ideal for massage therapists who have clients that need different types of treatment. For most professionals, the Saloniture massage table can accommodate a wide range of client needs with the multi-position support features. This fully adjustable table comes standard with detachable accessories such as a headrest, arm sling, lumbar support cushion and two armrests. The table remains sturdy with a strong base in every position, which makes it our top choice for the best adjustable massage table. Multi-position support. Consumers benefit from the versatility of this Saloniture model. The fully adjustable table allows professionals to cater to their clients’ preferences and specific ailments without moving them to another table. Accessory attachments included. Two armrests, a headrest, an arm sling and a lumbar support cushion come standard with this table. All of these accessories are detachable and can be stored inside the table when it’s folded for storage or transportation. Strong base to hold heavy weight. The manufacturer promises the table can support up to 450 pounds. However, customers claim that the massage table can hold more weight while maintaining stability. Easy to assemble. The Saloniture massage table folds in half with just a few quick steps. Users report that the quick folding system makes it great for storage when the table is not in use. Attachments don’t lock. Some customers reported that the headrest and armrests don’t click or lock into place, which makes them feel slightly less secure. © 2019 ReviewLab. All Rights Reserved.